Protective clothing. Our clinical team all wear gloves, masks that cover both the nose and mouth, and eyewear during every appointment to help prevent the spread of disease. Gloves and masks are changed between appointments and never reused. If there’s any risk of water splashing, we’ll also ask you to wear special glasses to protect your eyes. Providers wear special medical clothing that isn’t worn outside to keep outside bacteria and inside bacteria separate. Assistants and hygienists wear scrubs, while doctors wear lab coats. All of these clothes are sent to be cleaned every day. Hand hygiene. Providers thoroughly wash and/or sanitize their hands between every appointment. Protective barriers. We use “barrier tape” over objects we touch frequently but can’t sterilize. You might see us apply this to things like light switches, chair buttons, and computer mice. We change it between every person we see. The headrests on the chairs are covered with a disposable barrier that we disposed of and replace after each visit. We also put easily cleanable barriers over computer keyboards which we clean between appointments. Sterilization. All of our instruments and hand pieces are put in a high-pressure STATIM brand autoclave after every use to sterilize them. We closely follow the manufacturer’s instructions for maintenance and adhere to a routine cleaning schedule. We also monitor sterilization procedures using biological, mechanical, and chemical indicators. 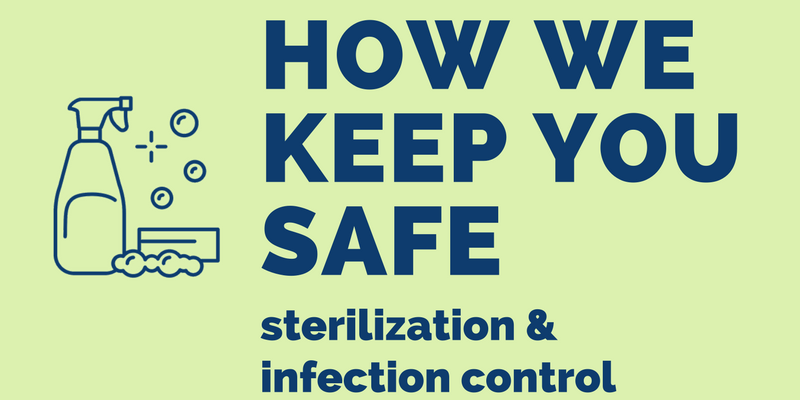 Biological monitoring is done by a third party to ensure no bacteria survives the sterilization process. We wrap and seal instruments in a package with an indicator that changes color during the sterilization process. This helps us identify instrument packages that have been sterilized, so there’s no chance that contaminated instruments could get mixed up with sterile ones. We’ll open the bag in front of you, so you know the instruments are pristine just for you. Disposable items. Anything that can be disposed of after every use is. You’ll get your very own suction straw, needle, air/water tip, and polisher tip at every visit. CaviWipes. If something like a countertop or a chair seat can’t be covered in a barrier, sterilized in an autoclave, or disposed of, then we use a clinical disinfectant to clean it between every appointment. Using this cleaner eliminates the possibility of provider transferring germs from a contaminated surface. We use Caviwipes, the same disinfectant as operating and emergency rooms.